So don’t be surprised when it happens. Like now. As soon as you realize that you probably will be able to identify the answer by the time you’re asked, buzz. Between the time you buzz and the time you’re supposed to speak, the answer will come to you. And if it doesn’t, the penalty for being wrong is small compared to the opportunity to get it right. This idea hit me hard the first time I heard it, and it continues to resonate every time. When I recently taught my social media strategy course with more than 100 amazing women entrepreneurs in it, it surprised me how many people are afraid to move forward for fear of not being perfect. At the time I remember feeling like a hot mess from trying to teach my first live class while my puppy had decided to do acrobatics (badly) on the couch behind me. I was creating and teaching the class at the same time, while also taking on a new client. I was exhausted and over-caffeinated, and a little overwhelmed. And yet, there’s only so much you can do. The clock says go, so you go. You rescue the puppy from where he got stuck in the cushions behind you, and you keep on going. Because that’s how life is. In the midst of my feeling like chaos and frustratingly amateurish, this person saw real and authentic. Even though I’ve been teaching on and off at National University for years, this was MY first course. If I had not given myself a point of accountability to actually start, I might have kept on practicing and might not have actually buzzed in to teach. And yet, this is a consistent theme, the idea that we have to keep practicing, editing, and perfecting until there’s nothing more to improve. And at that point, we’ve become boring (oh please no! ), and someone others can’t relate to. Why do we do this? Why are we so driven towards perfection that we allow it to hold us back? In reading his book (and many others like it), it becomes fascinating how our minds work. What keeps us from doing the things we really want to do comes in that giant form of Resistance, and keeps us from just buzzing in. 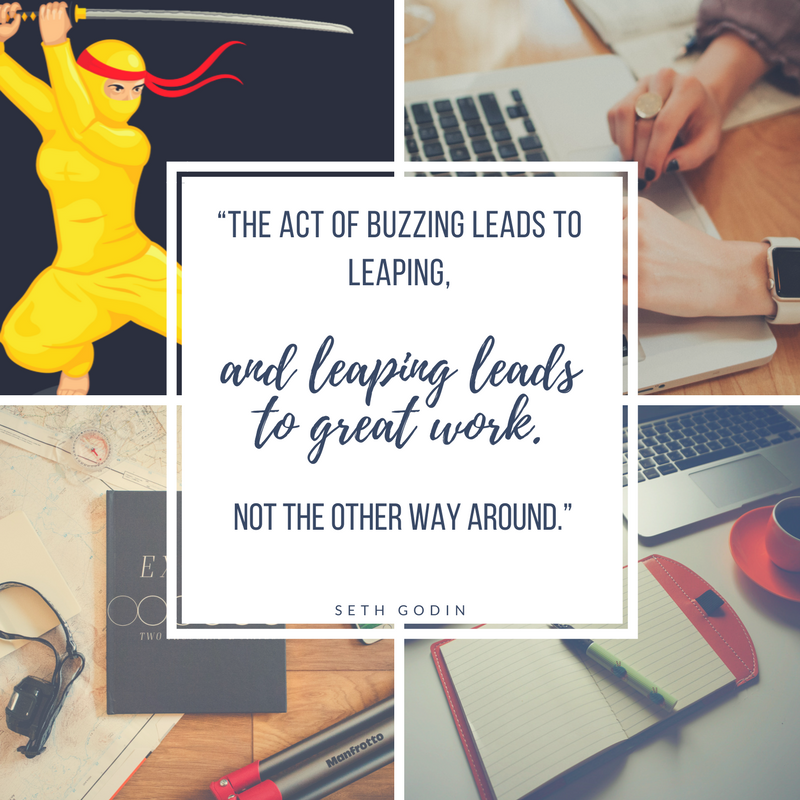 What’s holding you back from leaping towards great work? Take the first step and buzz in. It doesn’t have to be perfect, in fact it’s more fun when it’s not.